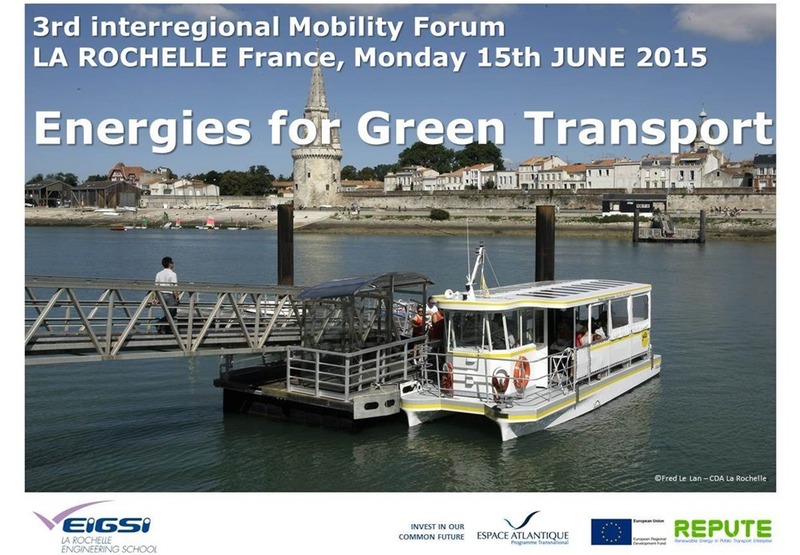 The La Rochelle conference focused on alternative energies in transport lies behind us. The city of La Rochelle, with its many experimentations about mobility, was the perfect location for 80 professionals to be inspired and exchange knowledge and experiences about Gas, Biogas, Electricity, Algaefuel, hydrogen power-togas and also magnetic levitation. The Vice-President of La Rochelle in charge of mobility and transportation Brigitte Desveaux stays all day long with us and present all the alternative energy scenarios about La Rochelle. Frederic Bataille from Valagro explained how algae can be the third generation of biofuels. Anne Meyer from UTP has presented a european overview about full electric and hybrid buses and the European ZeEUS project dedicated to experimentations. Both presentation of Pr Alan Hutchinson and Ghislain Delabie have shown that peri-urban and rural territories have to be innovative in their approaches, involving communities. EIGSI Research Dpt thanks the 18 keynote speakers for their invaluable contribution. EIGSI engineering school from La Rochelle westcoast south of France was in charge of the design and the management of the final conference Tour into all 6 regions and 5 countries implicated into the reputeproject. This Tour became reality because first of the enthousiams and dedication of all partners of the project. Team building and improvement of the dissemination : The Repute project was short 18 months long. By inviting all partners to do all conferences one after another (like a rock star tour ;)) it allows us to improve the next event itself and also to work together into the bus : travel time become this way a co working time with sessions about the ongoing events but also about future solutions, especially for rural territories, new ideas even if the repute project is closed. It’s trendy ! Many organizations (private and non for profit) do communication it this way. And for a transport project it make sense to do it this way. Regarding Atlantic area space, it helps us to show what is Atlantic area on a map and simply to promote Atlantic Area. We EIGSI asked OuiShare to ride the bus with us in order to offer some opportunities for cooperation among the team members of REPUTE. The perspective of spending some 22 hours on a bus between La Rochelle (France) and Torres Vedras (Portugal) both opened opportunities and looked a bit awkward. How to get 12 people conveniently work and share useful insights in a bus where you are supposed to seat 2 by 2, with no WiFi connection available and a diverse team of people focused on different tasks or needing to rest? Ghislain Delabie from OuiShare used iterative creative techniques to generate and challenge ideas 2 by 2, then meeting in the 6-person corner at the rear of the bus to collectively discuss issues. This time on the bus on the bus made it possible to know better each other, both professionally and personally, which is a clear asset for future collaborations. Through iterative creative workshops we also managed to raise a broad range of topics for future collaborations and to reflect on the outcomes of the REPUTE project. It ended with a 2-hours workshop drawing the possible basis for a future 3-year project. We are now convinced that this kind of mobile and collaborative workshop session would be a tremendous way of engaging partners and stakeholders in the future if this journey were scheduled right at the beginning of the project.